What does the Bible mean when it says in your anger do not sin (Ephesians 4:26)? 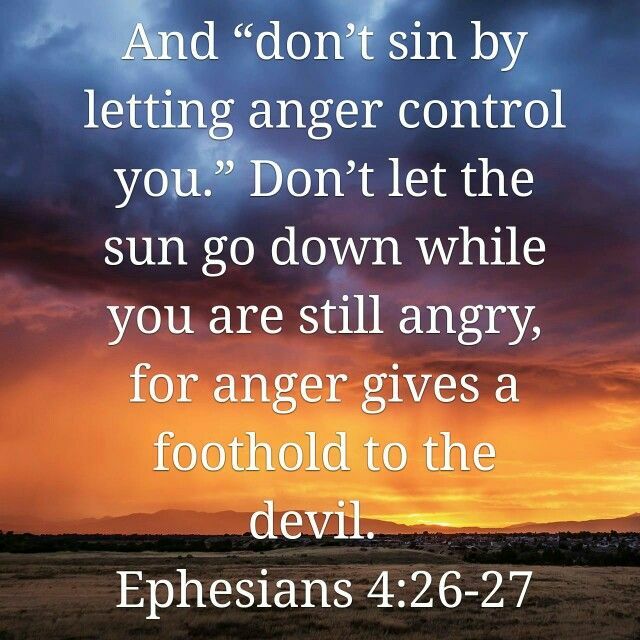 Answer: Ephesians 4:26 says, “‘In your anger do not sin’: Do not let the sun go down while you are still angry.” In understanding this command, it’s good to differentiate emotions from actions. We all feel emotion. At various times, we feel sadness, grief, frustration, excitement, happiness, and anger. Such feelings come naturally and are not sinful in and of themselves. It is how we act on those emotions that can be sinful. Emotion is internal and not directed against people. Action is external and can be directed positively or negatively toward others. Here is the context of the verse: “Therefore each of you must put off falsehood and speak truthfully to your neighbor, for we are all members of one body. ‘In your anger do not sin’: Do not let the sun go down while you are still angry, and do not give the devil a foothold. Anyone who has been stealing must steal no longer, but must work, doing something useful with their own hands, that they may have something to share with those in need. Do not let any unwholesome talk come out of your mouths, but only what is helpful for building others up according to their needs, that it may benefit those who listen. And do not grieve the Holy Spirit of God, with whom you were sealed for the day of redemption. Get rid of all bitterness, rage and anger, brawling and slander, along with every form of malice. Be kind and compassionate to one another, forgiving each other, just as in Christ God forgave you” (Ephesians 4:25–32). This passage follows Paul’s teaching about the new nature that we embrace through the Holy Spirit by faith in Jesus Christ (Ephesians 4:17–24). If we become angry for some reason—we experience the involuntary emotion or passion of anger—we are not to allow it to prompt sinful actions. And we do not stay angry. We do not dwell on it. We deal with it quickly, in constructive and God-honoring ways, so it does not grow stronger and produce bitterness in our lives. The biblical admonition is to deal with the anger on the same day as the provocation. Before we go to sleep that night, we should have taken positive steps to find a solution to the problem and alleviate the anger. If we fail to deal with anger constructively and we engage in sinful expressions of anger, we give the devil some leverage against us (Ephesians 4:27). The same passage continues to say that we should strive to get rid of all anger and its companion sins: “Get rid of your bitterness, hot tempers, anger, loud quarreling, cursing, and hatred” (verse 31, GWT). Instead of allowing the emotion of anger to turn into sinful actions, we should “be kind and merciful, and forgive others, just as God forgave you because of Christ” (Ephesians 4:32, CEV). It’s all part of “the new self, created to be like God in true righteousness and holiness” (verse 24). One of the powers that the Holy Spirit has given to believers after their spiritual transformation through faith in Jesus Christ is self-control (see Galatians 5:22–23). We need to ask God to fill us with His Spirit when we become angry; self-control will be the supernatural result. We all allow our anger to get the best of us at times. When we are wronged or feel unfairly disadvantaged, we naturally want to retaliate or “fix the problem” in the fastest way. But when our response involves “rage, anger, harsh words, and slander” (Ephesians 4:31, NLT), we have crossed a line. We have sinned in our anger and given the devil a foothold. Then, long after we should have moved on, we harbor a desire to nurse the wound and hang on to the anger. This only leads to bitterness. We must yield to the Holy Spirit and trust in His power to overcome such sin. “He who is slow to wrath has great understanding, but he who is impulsive exalts folly” (Proverbs 14:29, NKJV). “A hot-tempered man stirs up conflict, but a man slow to anger calms strife” (Proverbs 15:18, CSB). “Whoever is slow to anger is better than the mighty, and he who rules his spirit than he who takes a city” (Proverbs 16:32, ESV). This entry was posted in Control your anger, Daily Devotion, forgiveness and tagged anger, forgiveness, Love, prayer. Bookmark the permalink.